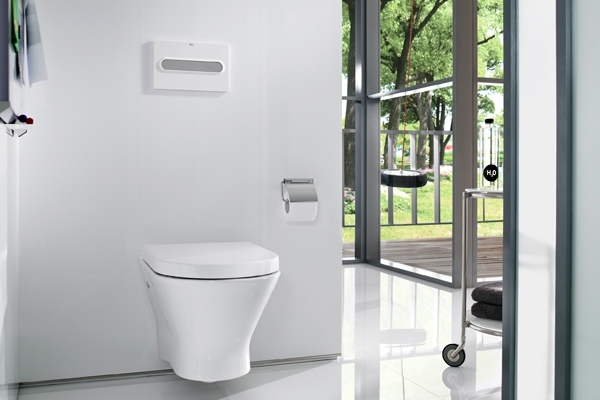 Roca has extended two of its best-selling sanitaryware ranges to include new WCs – the Nexo wall-hung rimless and The Gap comfort height WC. Maximising on hygiene and ease of cleaning in the bathroom, the popular Nexo WC from Roca (seen here) is now available in a wall-hung, rimless design. Compatible with all Roca Duplo concealed cisterns, the Nexo rimless WC operates with an ECO flush of 4.5/3 litres, helping to reduce water consumption while always delivering a powerful performance. The Gap comfort height WC, meanwhile, is available as either back-to-wall or close-coupled, both of which have a seat height of 480mm. Compared to a standard WC with a height of 400mm, The Gap comfort height helps to future-proof the bathroom, ensuring those with mobility issues can use the bathroom as comfortably. The back-to-wall pan is compatible with Roca’s Basic Tank Compact concealed cistern and operates a 4.5/3litre dual flush for reduced water consumption. Both the Nexo wall-hung rimless WC and The Gap comfort height can be easily combined with other sanitaryware and furniture in the Roca collection for a co-ordinated finish in the modern bathroom.